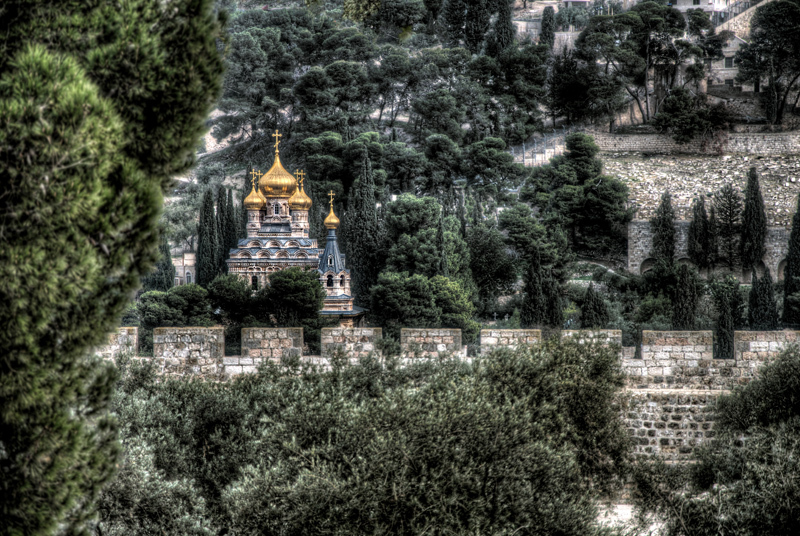 The Church of Mary Magdalene (Russian: Храм Марии Магдалины, Khram Marii Magdaliny) is a Russian Orthodox church located on the Mount of Olives, near the Garden of Gethsemane in Jerusalem. The church is dedicated to Mary Magdalene (Miryam of Migdal), a follower of Jesus. According to the sixteenth chapter of the gospel of Mark, Mary Magdalene was the first to see Christ after his resurrection. (Mark 16:9) She is considered a crucial and important disciple of Jesus, and seemingly his primary female associate, along with Mary of Bethany, whom some believe to have been the same woman. The church was built in 1886 by Tsar Alexander III to honor his mother, Empress Maria Alexandrovna of Russia. It was constructed to David Grimm’s design in the traditional tented roof style popular in 16th and 17th century Russia, and includes seven distinctive, gilded onion domes. The convent is located directly across the Kidron Valley from the Temple Mount. Two martyred saints, the Grand Duchess Elizabeth Feodorovna of Russia and her fellow nun Varvara Yakovleva are buried in the church. In the 1930s, Princess Alice of Battenberg, mother of the Duke of Edinburgh, visited the church and asked was to be buried near the Grand-Duchess Elizabeth. In 1969, she died at Buckingham Palace. In 1988, her remains were transferred to a crypt below the church.